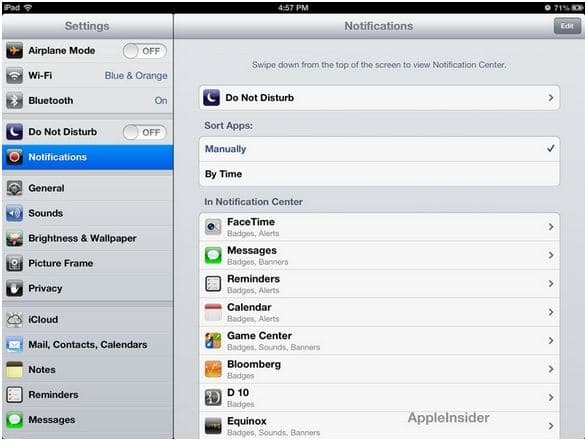 Turning Bluetooth on and off has become easier and faster in iOS 6. The Settings.app in iOS 6 now have a button for quicker access to turn off and on the Bluetooth. To turn off/on Bluetooth, previously, you had to go to Settings > General and Bluetooth; now you just have to click Settings from homescreen.You will also find in iOS 6 Settings a new “Do Not Disturb” and “Privacy” option. The “Do Not Disturb” options lets you turn set specific time to stop notifications from showing up on your iPhone or iPad. This option lets you exclude certain notifications from not showing up, even if the option is on. Another tab you’ll see is the Privacy option. 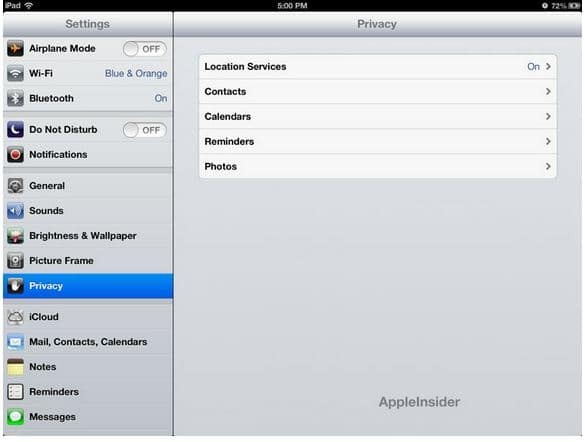 This option replaces the Location Services option, and moves Location Services inside the Privacy option. From the Privacy option, you can turn off / on Location Services and find out what applications are accessing your contacts, calendars, reminders and photos.